Anonymity with response devices helps medical trade association clear major hurdle in promoting audience engagement. Minnesota is leading by example in the healthcare technology industry with more than 930 health technology companies that contribute a $14.2 billion economic impact. That’s where the Medical Alley Association comes in. The state-based trade association serves nearly 700 member organizations, including many medical device and life science supporting companies. Each year, the association coordinates 100+ education programs in order to provide its members with networking and learning opportunities. An upcoming event with an audience of both healthcare professionals and members of the media had organizers a bit concerned. 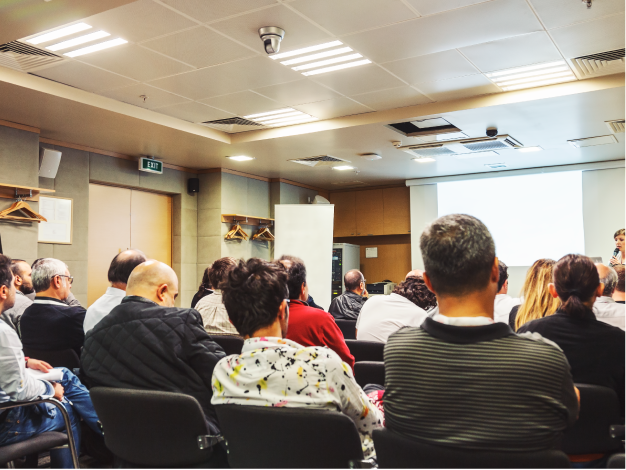 In order to initiate the conversation on a sensitive topic, the association needed a way to collect feedback without turning the meeting into a heated debate. Sharon Hollister is the education coordinator for Medical Alley. She is responsible for organizing the logistics before, during and after each program. She learned of Turning Technologies’ TurningPoint interactive polling software and audience response systems from a supervisor who spoke highly of the educational technology. TurningPoint and audience response systems were used in the program to gain preliminary perspectives, lead a panel discussion and wrap up the session. The audience reacted positively to the use of TurningPoint, and enjoyed instantly seeing the results on screen. Sharon had the ability to display participant responses immediately in order for the audience to form questions for the Q&A portion of the meeting. Organizers were very pleased with the results and the interaction the audience response systems sparked.